"Six Sick Senses" a whirlwind of Metal Church meets Sanctuary Metallicisms forged by a 30 year metal bond of industry pros who took matters in their own hands. Memorable choruses, thought provoking lyrics, riffage of the highest order. 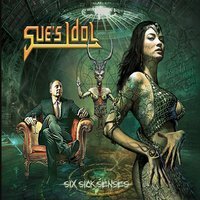 Sue's Idol "Six Sick Senses" a whirlwind of Metal Church meets Sanctuary Metallicisms forged by a 30 year metal bond of industry pros who took matters in their own hands. Memorable choruses, thought provoking lyrics, riffage of the highest order. A Menza styled drum attack combined with searing guitar solos from a Shrapnel Records guest make this the traditional heavy metal album of 2016. Get sick with Six Sick Senses today!